A total of 19 European players were in action during NBA’s 5-game New Year’s evening. 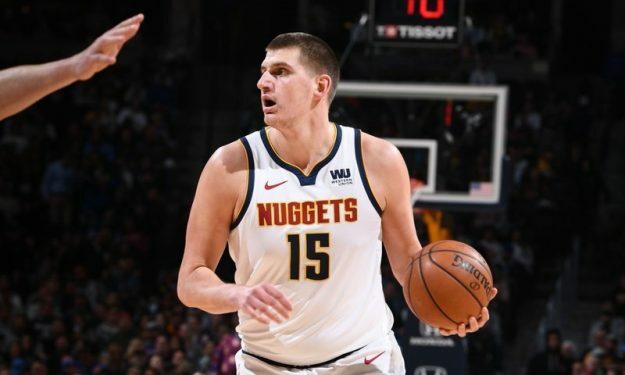 Nikola Jokic highlighted the European field on the first day of 2019 with a monstrous triple-double for the Denver Nuggets in their 115-108 home victory over the New York Knicks. The Serb forward/center finished the NBA 2018-19 Regular Season match with 19 points, 15 assists and 14 rebounds. His teammate, Juan Hernangomez, had eight points. On the losing side, Enes Kanter notched a 17-point, 12-rebound double-double, Frank Ntilikina added ten points, Mario Hezonja didn’t play and Kristaps Porzingis (left knee) remained on the sidelines. The Portland Trail Blazers grabbed an overtime away win against the Sacramento Kings, 113-108. Jusuf Nurkic dominated in the Golden 1 Center accumulating 24 points and 23 rebounds, also posted seven assists, five blocks and five steals! Bogdan Bogdanovic put up 19 points for the home side, Nemanja Bjelica had 14 points and a career-high 16 rebounds, Kostas Koufos added two points. Italian Danilo Gallinari went off for 21 points, but the Los Angeles Clippers suffered a 119-113 home defeat at the hands of the Philadelphia 76ers. Marcin Gortat had six points, Boban Marjanovic also played but failed to score, while Milos Teodosic didn’t leave the bench. Turk Furkan Korkmaz notched three points for the visitors, who survived their opponent’s fourth-quarter rally. It was a special night at the Scotiabank Arena for Kawhi Leonard, who scored a career-high 45 points leading the Toronto Raptors to their 122-116 win over the Utah Jazz. Serge Ibaka helped out with eight points and OG Anunoby added two, while Jonas Valanciunas (left hand) remained out. Rudy Gobert had 16 points, Ricky Rubio 14 and Thabo Sefolosha two for the losing side. Giannis Antetokounmpo was held to 15 points, but put up a monster dunk and helped the Milwaukee Bucks overpower the Detroit Pistons, 121-98. Ersan Ilyasova (face) remained on the home team’s injury list. Zaza Pachulia (right leg) also missed the match. However the Georgian’s center teammate, Jose Calderon played, but didn’t sink a bucket.